6 years ago, Nike introduced their lightest ever Eco-Friendly boot, and now they’re ready with their latest Greenspeed boot, the Nike Greenspeed 360. Are you also getting nostalgic and almost falling of your seat like us? Then keep on reading to get some crisp news on the Limited Edition GS 360. Let’s start with going back 6 years when Nike launched a Greenspeed boot, what back the was the lightest football boot on the market. Not only was it the lightest, but it was also Eco-Friendly. The Greenspeed was stripped from all unnecessary components, that wasn’t needed on a football boot, and only contained the most needed elements. This gave us a football boot made from recyclable, making the boot light, weighted only 160 grams, and explosive, while having a low effect on the environment and the planet. If this wasn’t enough Nike also produced a GS2 in a new and awesome white and black colourway with the popular ‘Safari’ pattern on the ACC details on the side of the GS2. Nike kept a low weight while also incorporating the ACC technology, making the already innovative boot even more innovative. Back then it was the young players such as, Walcott, Götze, Sterling, El Sharaawy, Eriksen and Neymar who was headhunted to wear the GS2 boot. Read more about the Greenspeed 2 here Continued below. A lot of stuff has changed throughout the last 6 years, and Nike has launched a lot of new innovative Nike boots and technologies, which of course has to be made into a Greenspeed boot. The iconic GS boot is being celebrated by getting some of the innovative stuff, while still being Eco-Friendly, so let’s see how Nike managed this. Let’s start with the upper of the GS360. Normally the upper of the Superfly is made from Flyknit, while the GS360 is made with a so-called Circular knit, made with a 360-degree execution. The collar also has a zero waste and is the first time we see the Circular knit in this type of execution. The upper is also all about recycled materials, as the ‘skins’ of the upper is made from recycled materials. Furthermore, the foam in the sockliner and laces are also 100% recycled, which makes this boot Eco-Friendlier than a typical normal football boot. Nike hasn’t only used this mindset on the boot, but they have also thought Eco-Friendly in terms of packaging. The boot box uses less ink, while the boot bag is made from recycled polyester. All in all, it’s awesome stuff, when looking on getting more waste out of the world, and making the planet better again. 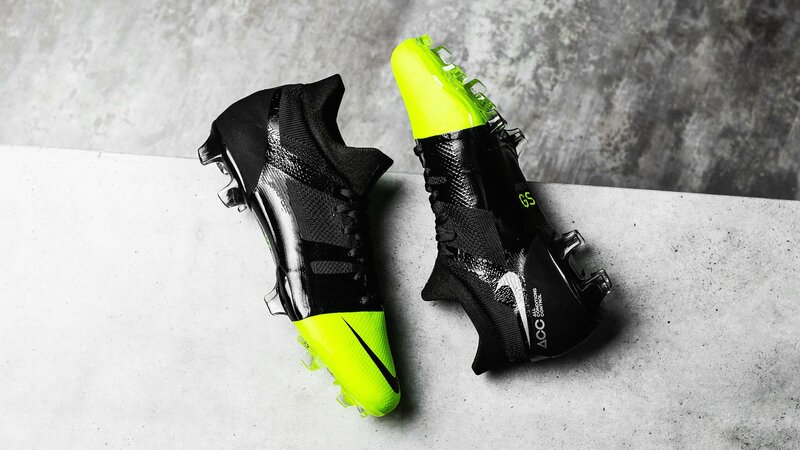 The Nike GS360 is all about speed and explosivity, and Nike has taken a lot of learning from the Mercurial silo and placed it into the Greenspeed 360 boot. The outsole is created with studs that benefits speed, and the studs are slightly differently place if you compare it to a Mercurial boot. This gives you a traction what you would expect from a Mercurial boot just made in a modern expression. The soleplate is also made in a different design, which makes it clear, making it able for us to see the knit wrapping underneath the plate and by extension, the foot. 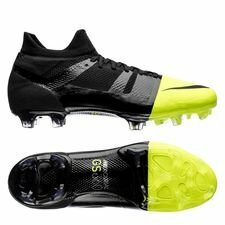 We mustn’t forget that the GS360 is like its predecessor, Nike Greenspeed 2, and comes with the famous All Conditions Control, more known as ACC. This coating allows you to get the best possible touch onto the ball in all kinds of weather conditions. Nothing will stop you from dominating the pitches during rainy or dry days. The GS and GS2 got sold out in no time, and we expect the same thing for the GS360 as there will only be 2018 pairs worldwide and all of the boots will be numbered. So, if you’re interested in your own pair, then be fast and get the boots exclusively at Unisport. But be quick!